2. To prepare chicken, combine first 6 ingredients in a medium bowl. Add chicken to bowl; toss well to coat. Let stand at room temperature 20 minutes. 3. To prepare sauce, combine yogurt and next 4 ingredients (through 1 garlic clove), stirring with a whisk. 4. Thread 2 chicken strips onto each of 8 (12-inch) skewers. Place kebabs on a grill rack coated with cooking spray; grill 4 minutes on each side or until done. 5. 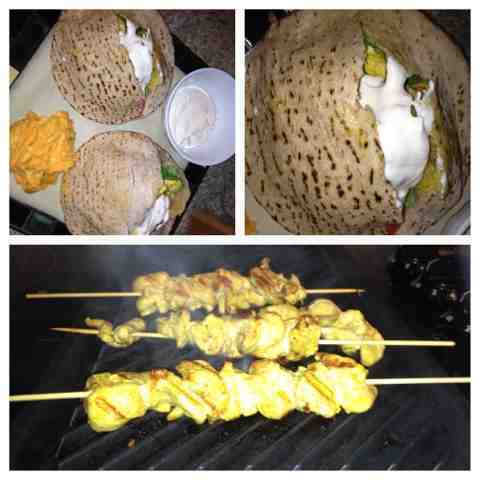 Place pitas on grill rack; grill 1 minute on each side or until lightly toasted. Place 1 pita on each of 4 plates; top each serving with 1/4 cup lettuce and 2 tomato slices. Top each serving with 4 chicken pieces; drizzle each serving with 2 tablespoons sauce.